Recently I looked at the outfits Mrs Obama has been wearing, celebrating her wonderful wardrobe, showcasing the work of some amazing designers and bringing style back to the White House. I wanted to have a look specifically at her evening gowns. I just love formal evening dress on Michelle, and her husband looks pretty pleased with himself, and very dapper in a great fitting dinner suit. I really love the full skirts of the red and orange numbers. It is such a flattering shape on Michelle who is both tall and rather full in the hips. Although I do very much like the grey sparkly number, and I think the big silvery necklace really makes the outfit special. I think Michelle generally suits the brightest and strongest colours best. I also think if you are the first lady and you have an exuberant personality you really should ramp it up when you are greeting the little man from Paris, France. Michelle looks positively regal in this utterly gorgeous Caroline Herrera gown with its massive, over layered skirt in hyacinth blue, falling from a black waist band, and lovely lace blouse. This is just a fantastic look, showing her body off to perfection and she has chosen colours which almost vibrate. The bouffant skirt minimises her rather large shoulders and this neckline is perfect, making her waist appear tiny. Feminine and gorgeous. Of course she doesn’t always get it right. Here are some looks that are less successful, in my view. Although the strong green is a great colour on Michelle, somehow the draped section looks weird and a bit droopy. The jewellery choice is startlingly underwhelming, and the look just too understated. The two corset dresses in black and teal are basically the same design – a rather slim column skirt with a close-fitting top with dropped shoulder detail. In my previous post I mentioned that knee-length fitted dresses were great on Michelle, but when they are floor length I feel they just emphasise how very tall she is. For evening I personally prefer a long, fuller skirt. The corseted body-con dresses feature better jewellery than the thin silver chain. The First Lady should look showy and important at these state events. While black is a great colour on Michelle, on its own with a severe hair do she is in danger of looking almost like her husband’s twin. The teal is somewhat better but the colour is not really doing anything for her (compare to the orange and red above). And it might just be me, but with all these three gowns her breast bone looks a bit, well, bony. I would advice a bit more uplift (obviously she’s wearing a better bra in the Herrera dress) or a higher neckline. 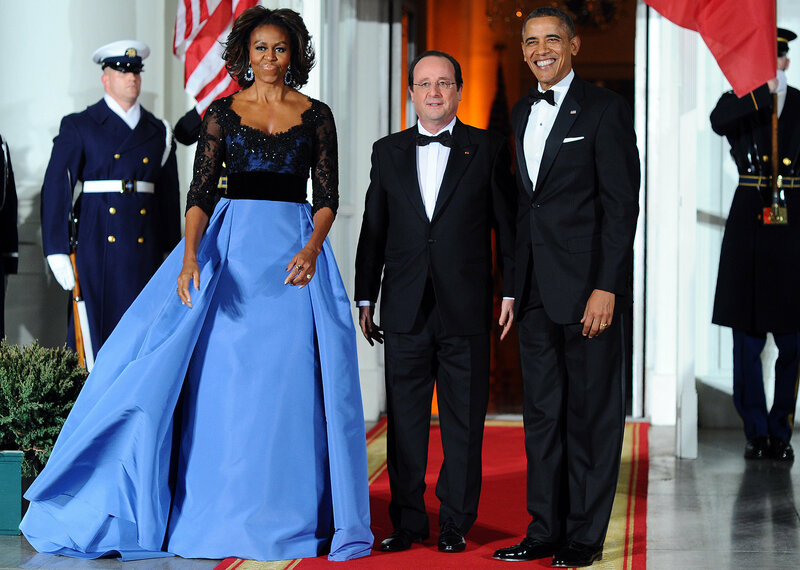 I’m relieved that even Mrs O can’t get a strapless dress that doesn’t squish and distort. Strapless, harrumph. You’re so right about the orange reds- vibrant and gorgeous. I think you are spot on with your assessment. She is positively regal, and isn’t that what we want to see, in the black/hyacinth number. I totally agree with you. What a sound style analysis! I love Michelle Obama’s flamboyant and daring style, as opposed to ex-First Lady Carla Bruni’s style, too dull and consensual. Agree 100% with your analysis. She looks amazing in the full looks! (Agree with Lesley that her bust looks better in the Herrera gown, too, rather than the corset dresses.) I also prefer her hair with fullness (whether up or down). I’m trying to imagine being able to wear an amazing Herrera gown and dwarf the French President at the same time…Oh la la what fun! I know, isn’t she lovely? Agree completely that the warm brights are the most flattering, altho the violet skirt is also fantastic. Well, I have to say that Michelle Obama’s main influence on me has been to encourage me to wear more cardigans. However, I don’t get invited to state dinners. My favorite is the orange. I have to echo the others. Your best/worst selection was spot on. She is such a beautiful woman, and her big personality really soars in the big, vibrant colors! The CH gown does look wonderful on her. I would love to meet and discuss fitting with the person that alters the RTW clothing that she often wears. And which sell out within hours. Her proportions are not quite standard, but her clothes always fit very well. I think she has great shoulders and collar bones, though it is obvious that she spends time in the gym to get that muscle definition. I agree with Amanda about the grey dress, which would be fabulous if it fitted better. Your assessments are top notch.